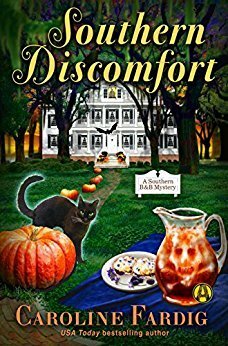 Caroline Fardig, has made my favorite authors list with her upcoming release of Southern Discomfort. You get an engaging mystery with elements of paranormal and romance and a surprising twist at the end, I was totally enthralled thought the story. The author really digs deep and shows you colorful fun love characters that you are rooting for way before the end and the story and the story setting is just fabulous. I really enjoyed this story because this Quinn is not your typical mystery sleuth, she is thirsted into helping her close friend and herself from being convicted of murder. She first has to get up the courage and then she has to figure out what she has to do to in order to find the real killer since the cops are only looking surface deep in the investigation.